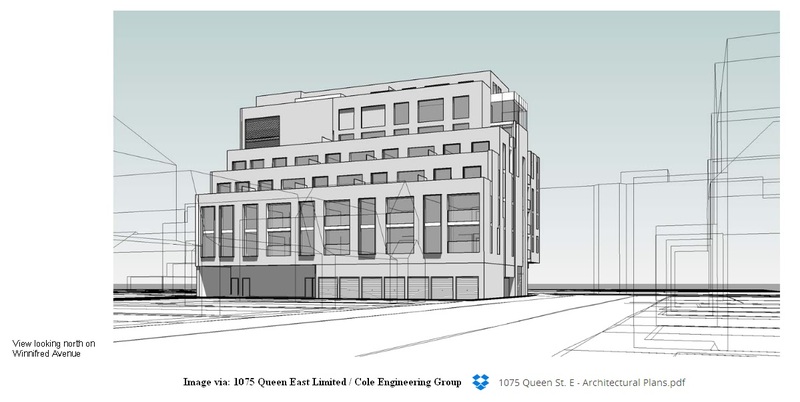 Ward 30 Bikes member, Michael Holloway’s write up concerning bicycle parking in the planning documents for the proposed apartment/retail development at Queen Street East and Winnifred Avenue, Toronto. 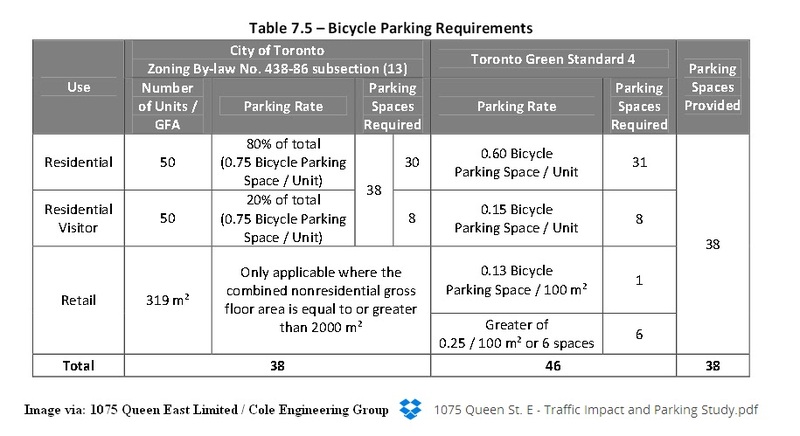 Having studied the Architectural Plans, and read the Traffic Impact and Parking Study I am very concerned that this development plan falls “17 bicycle parking spaces under the Toronto Green Standard(s)“. At the same time the study points to all the cycling infrastructure available already in place in the vicinity – it then uses these realities to downgrade it’s responsibilities to the commons – rather than as a reason to augment the commons with at least the minimum standard of bicycle parking amenities. From experience, if the planning of a building falls short in an area – one can assume that the finished product will fall way short of the intended outcome, that the guide-lines were intended to produce. I fear that this very much the case in this development proposal. The plan does not meet the requirements – and on top of that – the authors of the Study try to mitigate the shortfalls with semantics. And in mitigating their “technical shortfall” – turn the whole idea of multi-modal transportation theory on it’s head by for example – saying that – ‘as the sustainable transportation culture gains acceptance, car parking spots will become unused; and then can be turned into bicycle parking spots in the future’. But one of the fundamental understandings we have come to in city building is that if we don’t build towards the future that we want – it will not come. As it is designed now in these documents – this building will be a drag on changing the very culture that it supposes will resolve its’ shortfalls! Also very disturbing to me in these documents is the way the authors try to mitigate the bike parking shortfall by trying to add storage lockers to the bike parking count. This does not bode well for the design of the bicycle parking facilities themselves — which are not included in the drawings. To encourage people to use their bikes we have to imagine and build secure, easy to use, friendly spaces. Enough space in the bicycle parking area for example – that cyclists can do their bike maintenance in that area. Like perhaps, a complimentary fixed in place hand pump, a work bench area, a couple of bike stands for hanging a frame – to make it easy to work on. I imagine a ground level space that has an open and friendly feel; a space that lets natural light in during the day; a space that becomes a culture-of-cycling residents’ hub – part of the culture of the building – where cyclists meet and talk and do their bike maintenance; a place where parents teach their children how to do bike safety checks on their bikes before they head out to school – and so on. Instead I fear the ground level parking indicated in the drawings are for cars – and the bike parking area will be underneath it in the basemant – forcing cyclists to walk their bikes through doorways; through the lobby; and then into the elevators at peak usage times in order to park and retrieve their bikes for their commute to work every day. Perhaps as we negotiate the building height down towards this groups’ desired 4 story maximum height – more space will open up in the ground level parking area for a state-of-the-art bike parking facility that will be a great for the tenants and great for the owners – as it will draw tenants, and become a talking point in the neighbourhood, and perhaps further afield as well. The proposed site is located in a cyclist supportive environment with a dedicated bike lane along Eastern Avenue and Dundas Street East, a major and minor multi-use pathway (cyclist route #4 along Lakeshore Boulevard East and Woodbine Park), as well as on-street routes along adjacent residential streets. Based on the conceptual site plan, a total of 38 bicycle parking spaces are provided. 30 bicycle parking spaces are designated for occupants/long-term bicycle parking, while eight (8) bicycle spaces are designated as visitor/short-term parking spaces. Zoning By-law 438-86 sub-section 13 requires the provision of 38 bicycle parking spaces (30 residential occupants and eight (8) visitors) for the apartment rental component. As the proposed retail development is less than 2000 m², no parking is required under the current zoning by-law. Under the Toronto Green Standard 6, the development is required to provide 46 bicycle parking spaces (31 residential occupants and 8 visitors) for the apartment rental component and seven (7) bicycle parking spaces (one (1) retail occupants and six (6) retail visitor) for the retail component. The bicycle parking requirements are summarized in Table 7.5. Additionally, for comparison purposes, the bicycle parking standards contained in the New City-Wide Draft Zoning By-law have also been reviewed. Under the draft By-law the proposed development would have had to meet the following requirements: 50 bicycle parking spaces (45 long term and eight (8) short term) for the rental apartment units and five (5) bicycle spaces (one (1) long term and four (4) short term) for the retail component of the development. The proposed bicycle parking provision of 38 spaces is sufficient as it meets the Zoning By-law No. 438-86 subsection (13) minimum bicycle parking requirements. While the proposal presents a technical shortfall of eight (8) and 17 bicycle parking spaces under the Toronto Green Standards and, New City-Wide Draft Zoning By-law respectively, it is anticipated that additional bicycle spaces will be provided in the storage areas within the building GFA. Additionally based on the site plan, the City of Toronto provides at least 14 bicycle parking spaces via post and ring bicycle stands located along the sidewalk fronting the retails stores which would also be beneficial to the proposed development. With the noted non-auto supportive environment and infrastructure, the expected parking demand and supply pressure will likely continue to decline.